LDS General Conference is just around the corner. I love conference and the peace that comes from the inspired messages. I especially love it when I can actually sit and listen to the speakers. With 6 kids 12 and under, that is not always an easy task. I have tried several ideas to make conference more meaningful for my kids, and more relaxing for me. Some ideas have worked better than others. We have tried conference bingo, tents in the living room, and envelopes with a candy, just to name a few. I am not a huge fan of the projects that take a lot of beforehand shopping and prepping, or of activities that get turned into a circus by my toddlers. Simplicity seems to be the key for us (and less sugar). I have loved coloring books and journals for my older kids. Conference journals have been super effective for us. When we have them, my kids want to make sure they have something written or drawn for each speaker. Yeah! Last week I saw the idea to put tabs on the journals and personalize them beforehand. I loved that idea, but could not find updated tabs for the current General Authorities, so I decided to made my own. I showed my kids the idea and got out the scrapbooking paper, scissors, and glue. They spent hours laughing and helping each other on this project. Now even my littles have a book to color in during conference. They keep asking me how many days until conference because they are so excited. 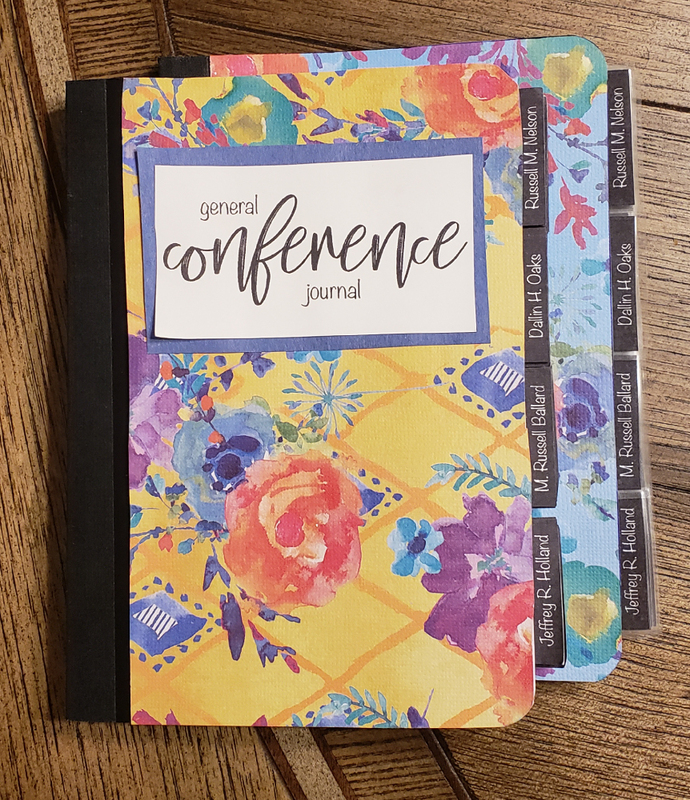 We used 5×7 inch journals which were only 67 cents a piece at Walmart. My kids decorated the journals with pattern paper. They traced the journals on the paper and cut it to fit. We found that Elmer’s glue worked best to glue the paper to the covers. We printed the prophet tabs on card stock and glued them on every other page with a glue stick. If you line the edge of the picture up with the edge of the page, the black tabs stick out perfectly and evenly. My kids got a little fancy and laminated their tabs, but they look great even if you don’t. I also found some cute activities from The Friend and online (including this site) and modified them to be current. We printed those on regular paper and put them in the backs of the journals. Since my kids enjoyed this project so much, we also made these journals in Activity Days. Now we are all set for conference. I am thinking we will have a bowl of trail mix to enjoy while we write. Let me know how your books turn out. What other ideas for conference do you love? Previous post: Toy-free bedrooms: How to create a playroom for your kids!